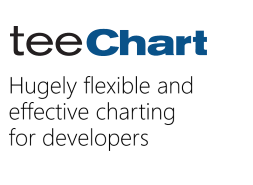 Attached please find a sample project that demonstrates an issue with T Chart display. Please unzip this zip file into a new folder. Open the solution it in Visual studio and run it. The program creates a fast line series and displays it. By default color of the series is blue and it looks smooth and correct. Click on the button below the chart on the form and it brings up the built in chart editor. Click on the Series tab and change the color to Red and hit OK. Notice that now the line displayed does not look very smooth. You can see in the display as if multiple line segments are put on top of each other. Now go back to the editor using the button below and click on the Series tab and change the width to 1. Now it looks like a straight thin read line and a thicker red segments on top of the thin line. I am not sure why the display looks like this instead of a smooth straight line. The problem is also more visible when selecting Green color. Please let me know how to fix this. Seems the problem is caused for the axis scale. And change the color the smoothed problem doesn't occurs. Therefore, is possible the problem you're experiencing is caused for the fasline representation in the chart using a custom left axis scale. Could you tell us, if you do the tests above the line is represented in your end, after you change the color? then the line looks smooth. But this option is not going to work for me. I need to able to control the min and max of the custom axis as it is shared by multiple series. And the min and max is decided by all the points and not just the points on one series. Also if you zoom in the chart then you can again start seeing the line segments again even when SetMinMax is not used. Please let me know if there is a solution to this issue. Many thanks for do the test. Feel free to add your mail to the CC list of the other tickets to be automatically notified when they'll be updated. I wanted to check with you about the status of this issue. Do you have a fix or workaround to resolve this issue? Thank you for your help. NSAI wrote: I wanted to check with you about the status of this issue. Do you have a fix or workaround to resolve this issue? Thank you for your help. This issue id=1591 has been marked "RESOLVED NOTABUG", and the reasons for marking it so are clearly explained with code examples in the ticket. I am still hoping to get some workaround/fix for this issue. Even if it is a Windows GDI issue how does it work when the color is blue? Please let me know if you have a workaround. The results do not vary either in TeeChart nor in the test UserControl when using a Blue pen instead of a Red pen. Could you please send code and images which show the difference between the two pens so we can try and reproduce the difference here? If there was a difference we could reproduce then there might indeed be a possibility of workaround - if there is none, such as I obtain now, then a workaround will not be forthcoming.